Buy Cotswold Carob Powder 250g in the UK from our online shop or directly from our independent Scottish store. If you want to automatically receive an email when 'Carob Powder' is back in stock, just leave your email address below. Carob powder is a natural substitute for chocolate. Carob powder is frequently used as a substitute for cocoa powder when baking, although you need more carob powder to get a similar level of chocolate flavour. There is a good level of calcium in carob powder and it contains less calories than cocoa. Use carob in a similar way to cocoa in cakes, desserts, biscuits, ice cream, caffeine-free chocolate, hot chocolate drinks and many other recipes. It is a little sweeter than cocoa, so please allow for this when adding sugar. As official Cotswold stockist, we sell genuine Baking Sundries directly from our shop in Scotland and online throughout the UK. Cotswold is a brand producing quality loose herbal teas like: peppermint, chamomile and mate tea. View more products from Cotswold. 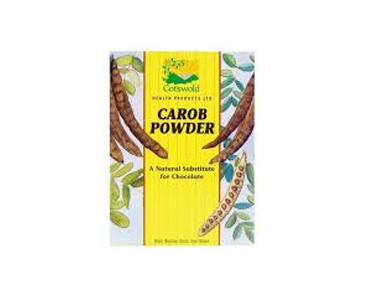 Where can you buy real Carob Powder safely online? If you are wondering where you can buy Cotswold Carob Powder 250g safely online in the UK, then shop with us. We are an actual health foods shop; with real people selling real foods and products. Our award-winning independent shop is located in Stirling, Scotland since 1976. You can buy our Loose herbal teas and other genuine Baking Sundries in store or safely place an order with us online or over the phone. Carob Powder - Cotswold Carob Powder 250g in Baking Sundries and Baking.